I never would have read a book with this title unless it was written by my nutritional mentor Jonny Bowden. 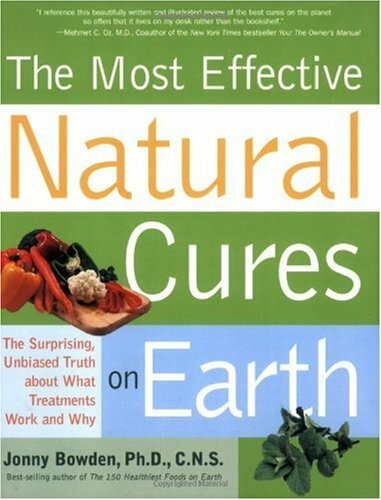 Most Effective Natural Cures on Earth: The Surprising Unbiased Truth about What Treatments Work and Why is by Jonny Bowden Ph.D. C.N.S., who wrote my favorite book on food The 150 Healthiest Foods on Earth. I come into this topic with a lot of bias. My belief is most supplements and alternative health practices are a waste of money. Dissecting healthy food into components and then bottling them for sale strikes me as modern day quackery. Just eat a wide variety of healthy food and cut out the middle man. Author Jonny Bowden must have read my mind when he wrote the introduction. He set expectations in a realistic manner, which in uncommon in the alternative health field. The book didn’t convince me of all the cures, but he did make a convincing case for a few supplements, so I consider the book a success. This is the first edition of this book. I’ll be interested in reading future editions as certain supplements fall into and out of favor. One complaint I have with this book is the index was poorly constructed. Unlike the index in The 150 Healthiest Foods on Earth, the index in this book is missing a lot of detail. There are cures for asthma and acne in the book, but those conditions do not appear in the index. I feel sorry for the guy having to flip through 340 pages while having an asthma attack, because asthma wasn’t added to the index.